Piedmont is known for rich dishes featuring truffles and cream sauces, but it’s also Italy’s most culinarily progressive region. Writer Anya von Bremzen meets its brash young chefs and tries something called a virtual oyster. Piedmont, Italy’s staid northwestern region, is famous for the country’s most tradition-bound cooking—insanely eggy pastas, vitello tonnato, the boiled-meat dish bollito misto—plus rivers of pedigreed red wines like Barolo, Barbera and Barbaresco. But there’s a little-known fact: Piedmont, which also happens to be Italy’s most developed and industrial area, is forging a new identity as its most exciting and progressive restaurant region, where young local chefs have been playing catch-up (and forming close ties) with Spain’s avant-gardists. To report on Piedmont’s burgeoning New Wave culinary scene, my boyfriend, Barry, and I arrived with a simple plan: Spend a few days in the wine-growing countryside—perhaps with one classic trattoria detour—then do the same in the region’s capital, Turin. We started our exploration in Alba at restaurant Piazza Duomo, which sits on the town’s main square. Alba is the resolutely provincial Piedmontese stronghold renowned as the world’s white-truffle mecca, but Piazza Duomo celebrates the brilliant cross-cultural cooking of Enrico Crippa, its 37-year-old hipster chef. Crippa was the star protégé of Gualtiero Marchesi, the Lombardian who almost single-handedly created the minimalist, elegant style we know as modern Italian. While running Marchesi’s restaurant in Kobe, Japan, Crippa became expert in Japanese flavors, and at Piazza Duomo, he dots shiso-spiked broth with crunchy quinoa crackers, rabbit sweetbreads and tiny cubes of house-fermented chickpea miso. Crippa’s current infatuation is with the vegetable-obsessed French chef Michel Bras; it shows in dishes like Salad 41, named for the number of leaves, flowers and herbs it contains. Piazza Duomo is owned by the Ceretto winemaking family of Barolo and Barbaresco fame, which accounts for the deep cellar. We ate in the spare upstairs dining room, decorated with whimsical frescoes by star painter Francesco Clemente. Joining us was an Italian gourmand named Giorgio Grigliatti, a good friend of avant-garde master Ferran Adrià, of Spain’s El Bulli. After lamenting the current trend of consuming Barolos too young, Grigliatti raved about Crippa’s cooking. “He has the most cosmopolitan palate in Italy. But locals don’t get his international style,” Grigliatti whispered angrily as we left. Out in the Piedmontese countryside, we stationed ourselves at Villa Tiboldi, an inn perched on a vine-covered hill 10 miles north of Alba. 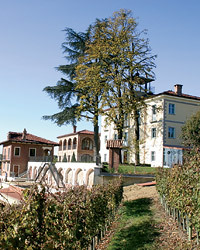 The antiques-filled 18th-century property belongs to the Malvirà winery in Roero, which borders Barolo. Hoteliers and winemakers Roberto and Patrizia Damonte poured us their soft, lush Arneis and austere, faintly minerally Nebbiolos. When I mentioned wanting to visit other winemakers, Roberto insisted that these winemakers come to us—bearing bottles. Which is how we ended up on Villa Tiboldi’s panoramic terrace, dining with the Piedmontese wine royalty. They were quite a crew. Barolo baron Domenico Clerico, dressed grandly, could have stepped out of a Renaissance fresco, while leather-clad Barbaresco king Bruno Rocca arrived on his Triumph motorcycle. My favorite character, Walter Massa, sported a cool, clubby riff on cowboy-wear, replete with handcrafted snakeskin boots. Arneis may be Piedmont’s best-known white, but Massa has made news by reviving an indigenous varietal called Timorasso in southeastern Piedmont. His bright, complex whites are the current favorite of young Italian sommeliers. While we ate delectable frog’s leg lollipops fried in focaccia batter, our dinner companions discussed their shared commitment to terroir and defiance of globalization in producing their modern-style wines. For lunch the next day, Grigliatti sent us to an ur-traditional trattoria called Marsupino in the village of Briaglia. After an hour of scenic hairpin roads and missed turns, we arrived at the charmingly chintzy place to learn that Grigliatti had preordered our wines: Champagne, a Barolo and a big Barbaresco—just for Barry and me. Three generations of the Marsupino family hovered by our table, bringing one amazing dish after the next: rooster agnolotti, snail-and-leek casserole, tongue in salsa verde and 40-egg-yolk tajarin (tagliatelle). After that binge, we needed detox. Instead, we took a plunge in Villa Tiboldi’s pool, then—impossibly—ate our way through the menu at All’Enoteca in the nearby town of Canale. I place the blame on Davide Palluda’s (pictured above, left) light, revisionist cooking. The thirtysomething chef, who has worked all over Europe, presides over a beautiful, airy dining room with Oriental rugs and silk drapes over tall windows. Before dinner, he explained his approach. “My clients are local winemakers,” he said. “I try to appease them with food they recognize while discreetly pushing the boundaries.” For his Head to Hoof Cow, Palluda takes the Fassone cow offal that locals adore and serves it as a pretty mosaic of terrines, salads and fritters; for dessert, he fills carob-flour ravioli with an explosion of liquid Blu del Moncenisio cheese, and tops it with a sauce of diced pears and almonds. 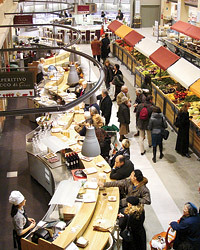 The Enoteca complex also houses Roero’s regional wine center and a shop stocked with Palluda’s conserves. We left loaded with jars of his rabbit ragù and Barolo-packed peaches. Still ahead was the Piedmontese meal I was anticipating most: lunch at Combal.Zero, the Michelin-starred restaurant at the Castello di Rivoli contemporary art museum (pictured, left), just west of Turin. Largely unknown in the U.S., Combal’s unstoppably innovative chef, Davide Scabin (pictured below, left), is mentioned by European food cognoscenti in the same breath as Adrià and Heston Blumenthal of England’s Fat Duck—and as the most ironic and provocative chef of the trio. Those who order the tasting menu called “.Zero” at his art-filled dining room are treated to a multicourse meal more conceptual by half than the art installations inside the museum: Virtual Oysters (a combination of watermelon, anchovies and almond that, improbably, tastes exactly like oysters); Ravioli Shake (tubes of pasta and two kinds of butter meant to be shaken up); Hambook (prosciutto and melon gelée served inside a hollowed-out book). Part comedian, part philosopher and part engineer, Scabin often channels his fascination with industrial design and theories of perception into playful “kit cuisine.” In a dish called Piolakit (piola is a Piedmontese osteria), tasting portions of regional classics—cotechino sausage, bagna cauda, agnolotti in brodo—come packed in mini jars fitted into a cardboard box with vials of Barolo and a deck of playing cards. The cards are both an indispensable part of a piola night and Scabin’s ironic comment on random commercialization of taste memories. I ducked into the kitchen for a quick ciao—and stayed for two hours as Scabin expounded on how Italian chefs were ruining pasta by not getting the salt content of cooking water right. (He’s working on a line of presalted pasta water solutions, each tailored to a particular shape.) Back at the table, Barry, sullen and bored, read me the gastro-widower’s riot act. But dessert—a bag of candy attached to a helium balloon filled with Campari vapors—saved our relationship. Our hotel, the Renzo Piano–designed Méridien Art+Tech, sat across the street from Eataly (pictured, top right). This vast emporium in a converted vermouth factory showcases artisanal products sanctioned by Slow Food, the organization dedicated to preserving traditional foods. Every morning, I strolled among aisles of Barolo vinegars, acres of handmade pasta and more than 250 kinds of handcrafted cheese, including such Piedmontese favorites as the ricotta-like, hay-wrapped seirass del fen. I wasn’t surprised that the hazelnut gelato at the Agrigelateria San Pé counter was crafted from milk pumped from cows that morning. Besides several dining bars, Eataly has an ambitious restaurant with a long name: GuidoPerEataly–Casa Vicina. Its slatted-wood design (more Tokyo than Turin) sets the scene for delicious updated local comfort foods, like bagna cauda reimagined as a tricolor vegetable puree, with a pungent anchovy accent. On our last night in Turin, we ate at the Michelin-starred Locanda Mongreno, run by former bass player Piercarlo Bussetti. Even more worldly than Crippa, Bussetti has cooked not only in Japan, but in Washington, DC, as well, with chef Roberto Donna. One has to love a cook who divides his tasting menus into Medium, Hard and Extreme sections, according to the intellectual challenge. The Hard option cleverly resolves Piedmont’s traditional-versus-trailblazing dichotomy by pairing classic dishes with their deconstructed doubles. Light potato gnocchi with wilted sage was followed by crunchy-liquid croquettes of potato velouté. Then there was the dual vitello tonnato: boiled veal in tuna mayonnaise, plus the same ingredients reconceptualized into a caramel-poached egg filled with tuna, powdered capers and anchovies—presented on a spoon of veal consommé. The meal was a perfect summation of the modern Piedmontese food scene: nothing lost from the past, and everything gained from the future.